How can the cultural sector respond to the referendum? How we might frame that reflective opportunity? What might we learn from the different beliefs which shaped individual votes? Where might we find common ground and shared values? 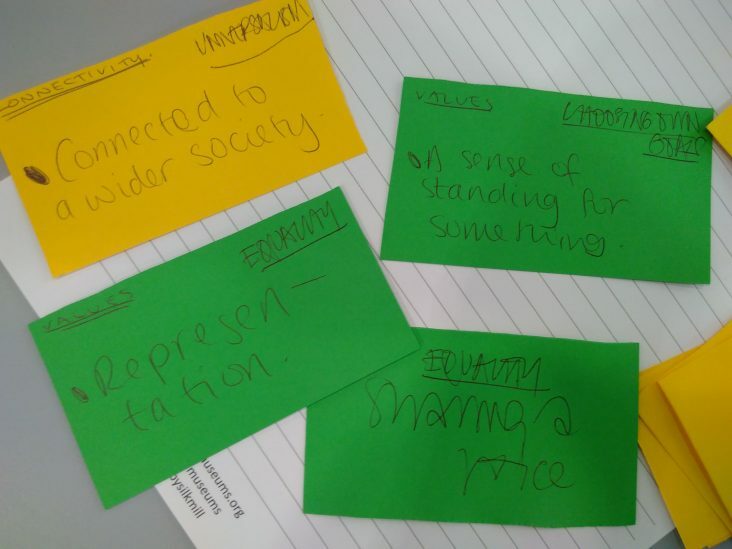 In February 2017 Happy Museum hosted a practical workshop which started by exploring the debate and considered what could inform the role of museums and cultural organisations in building connection and social capital in their communities. The workshop looked at the experiences that shape our decisions, and explored ways to relate to people who voted differently. It brought together thinking from neuropsychologist Kris De Meyer in relation to the psychology of the referendum and how in building our beliefs we may have become more divided. Meanwhile Tom Crompton of Common Cause investigated our values and considers what we share, as well as what divides us. Both had contributed to sessions at past Happy Museum Study Group residentials. It opened up discussion, debate and for consideration of our role and that of our organisations. Read a Storify Report of the event including links to post event blogs. The event was hosted by Tony Butler (Director Derby Museums) and Nat Edwards (Heritage Museums Consultant and previously National Trust for Scotland). * There is a mini-anthology of writing about Brexit from the arts and cultural sector put together by James Doeser here .